Exhibition. July 15, 2018–January 13, 2019. Situated between the capitalist West and the socialist East, Yugoslavia’s architects responded to contradictory demands and influences, developing a postwar architecture both in line with and distinct from the design approaches seen elsewhere in Europe and beyond. 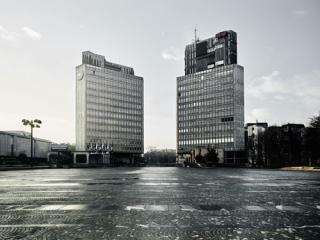 The architecture that emerged—from International Style skyscrapers to Brutalist “social condensers”—is a manifestation of the radical diversity, hybridity, and idealism that characterized the Yugoslav state itself. Toward a Concrete Utopia: Architecture in Yugoslavia, 1948–1980 introduces the exceptional work of socialist Yugoslavia’s leading architects to an international audience for the first time, highlighting a significant yet thus-far understudied body of modernist architecture, whose forward-thinking contributions still resonate today. Toward a Concrete Utopia explores themes of large-scale urbanization, technology in everyday life, consumerism, monuments and memorialization, and the global reach of Yugoslav architecture. The exhibition includes more than 400 drawings, models, photographs, and film reels from an array of municipal archives, family-held collections, and museums across the region, and features work by important architects including Bogdan Bogdanović, Juraj Neidhardt, Svetlana Kana Radević, Edvard Ravnikar, Vjenceslav Richter, and Milica Šterić. From the sculptural interior of the White Mosque in rural Bosnia, to the post-earthquake reconstruction of the city of Skopje based on Kenzo Tange’s Metabolist design, to the new town of New Belgrade, with its expressive large-scale housing blocks and civic buildings, the exhibition examines the unique range of forms and modes of production in Yugoslav architecture and its distinct yet multifaceted character.